The Ham Slams erupted for 12 runs in the first inning and set the team single-game record for doubles as Charlie quieted the Eastbound bats in a 15-2 victory. The win gave the Ham Slams a chance to catch Cookies & Cream in the standings and, if they got some help from the rest of the EWL, take control of the #3 seed heading into the playoffs. Alan tied the single-game record for doubles, Tim went an incredible 8-for-8, and Steve hit for the cycle in what may have been the greatest game in Ham Slams history. Charlie started for the Slams, and he kept the Morrison-less Eastbound bats in check throughout the game. He retired Hartley to start the top of the first, and Nate was called out for the second out of the inning trying to extend a double into a triple. He would get all of the run support he would need in the bottom of the first. Tim led off the inning with a single, and he scored when Dan followed with an RBI double to make the score 1-0. Alan followed with an RBI double to make the score 2-0, and Steve also doubled to make the score 3-0. Tim then hit an RBI double to extend the Slams lead to 4-0. 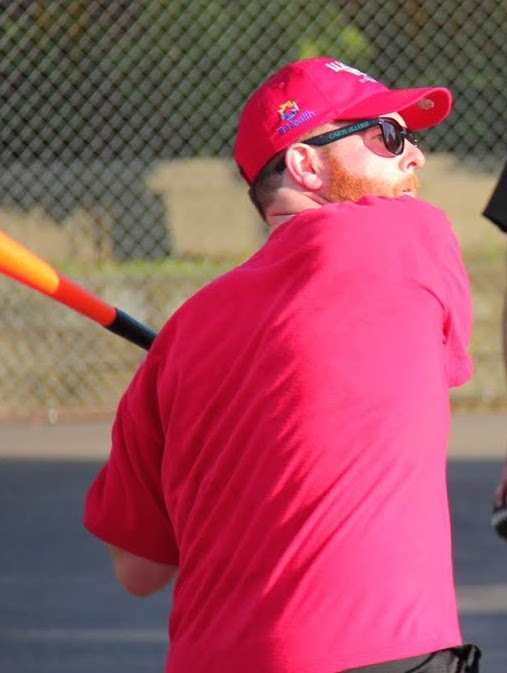 Dan followed with a line drive off the fence, but he was caught in between second and third trying to secure a triple, making another RBI double for the Slams. Alan then doubled, and the Ham Slams had hit seven consecutive doubles off Eastbound & Dahn’s starter, Christian. Steve broke the doubles streak, but his RBI single scored Alan to make the score 7-0. Tim then hit yet another double, scoring Alan to push the score to 8-0. Dan followed with an RBI triple, and he scored when Alan hit his third double of the inning. Steve then cleared the bases with a two-run homer, the Slams first homer of the game, and they led 11-0. Tim followed with a solo homer, his fourth hit of the inning, and the back-to-back homers made the score 12-0. The historic inning finally came to a conclusion when Christian got Dan to fly out to right for the second out of the inning. The Slams had recorded 12 runs on 13 hits in the bottom of the first, and Tim, Alan, and Steve were a combined 10-for-10 in the inning. In a single inning, the Slams hit 8 doubles, one shy of the single-game record, and Alan had 3 of them, also one shy of the single-game record. Down twelve runs, Eastbound would get on the board in the top of the second. Christian led off the inning with a double, and after Charlie struck out Steve, he gave up an RBI double to Hartley, making the score 1-0. Charlie avoided further damage by retiring Nate to end the inning. Alan led off the bottom of the second with a single, and Steve followed with a double, the Ham Slams ninth in the game. Alan was caught in between second and third on the play for the first out of the inning. Tim followed with an RBI double, scoring Steve and setting a new single-game record with the 10th double. Tim was also caught in between second and third for the second out of the inning, the third time the Slams had been caught in between bases in the game. Christian did his part to provide his own run support in the top of the third, leading off the inning with a solo homer to make the score 13-2. Charlie retired Steve and Tim to end the inning with an eleven-run lead. Dan led off the bottom of the third with a single and moved from first to third when Alan followed with a double, his fourth of the game, tying the single-game record. Steve then doubled, clearing the bases and extending the Ham Slams lead to 15-2. Steve was caught trying to extend the double into a triple on the play, the fourth time the Slams were caught in between bases in the game. Tim followed with a single and moved to third when Dan doubled, putting two runners in scoring position for Alan. Christian, however, got Alan to ground out to left for the second out of the inning, stranding both runners. Nate started the top of the fourth with a double, but Charlie stranded him, retiring the next two batters to maintain the big Ham Slams lead. Tim singled with one out in the bottom of the fourth and moved to third when Dan singled, but the Slams couldn’t capitalize, as Christian retired Alan to strand two runners for the second consecutive inning. Charlie retired the side in order in the top of the fifth, and the Slams continued to lead 15-2. Steve came into the bottom of the fifth a triple shy of the cycle. He hit a liner off the fence and raced around the bases, and it looked like he would have an inside-the-park home run. However, Hartley got the ball to the mound, catching him in between third and home for the first out of the inning. It was the fifth time in the game the Slams were caught in between bases, but Steve had hit for the cycle. Tim then hit a one-out single, making him a perfect 8-for-8 on the day. Dan followed with a single, but Tim was caught in between first and second, a remarkable sixth time Eastbound had recorded an out in the field. Eastbound went quickly in the top of the sixth, as Charlie retired Christian and Steve consecutively to end the game. 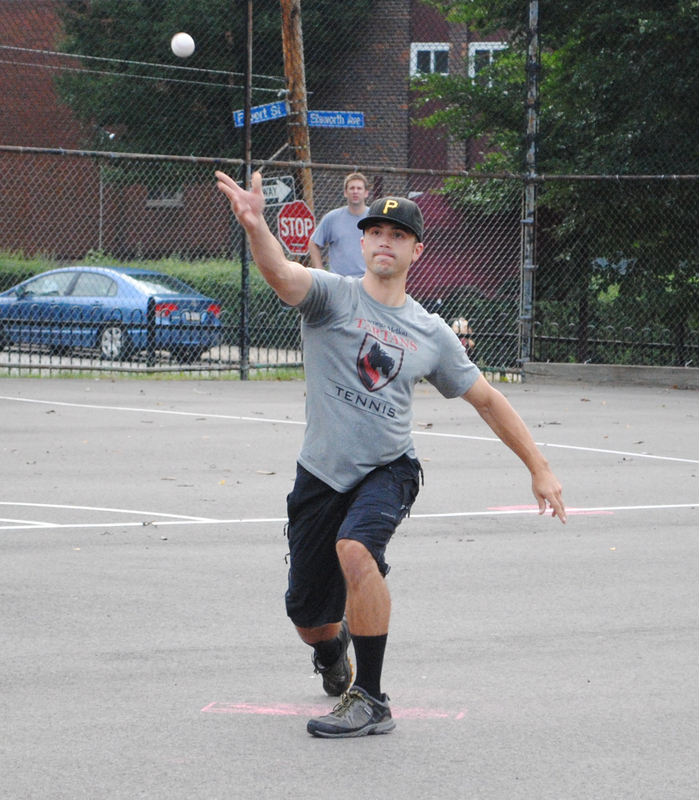 Charlie had retired the final six batters he faced and 8 out of the final 9, to give the Ham Slams a 15-2 win. 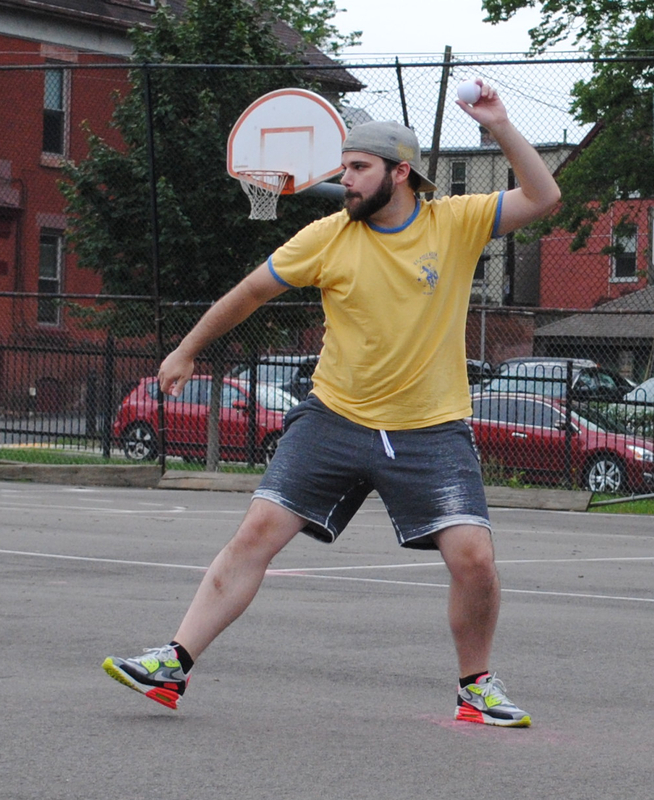 The win moved the Ham Slams to 7-12 on the year, and the loss dropped Eastbound & Dahn to 10-9. 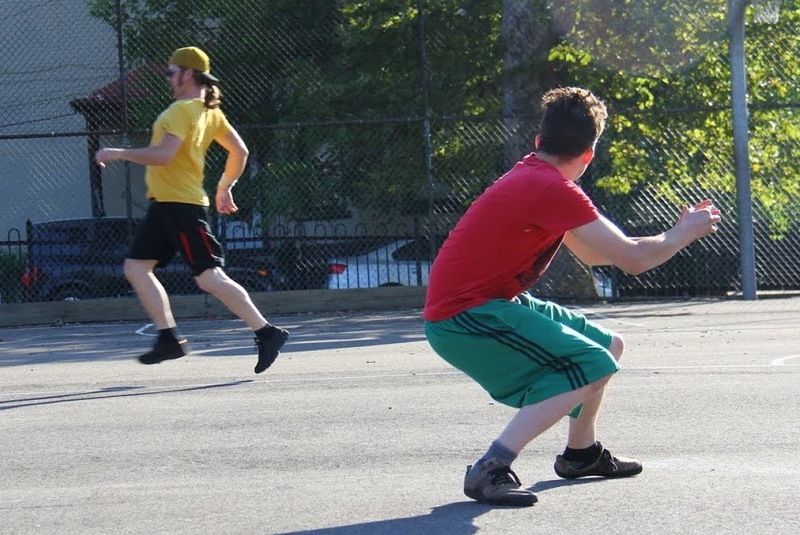 The Ham Slams took the season series with Eastbound 4 games to 3. – Charlie pitched the complete game win for the Ham Slams, allowing 2 runs on 5 hits and striking out one in 6 innings. Charlie has now won 4 consecutive games after starting 0-7 to move to 4-7 on the year. – Christian pitched the complete game loss for Eastbound & Dahn, allowing 15 runs on 26 hits in 5 innings. He tied the single-game record for hits allowed with Riley, who allowed 26 hits in a single start for the Ham Slams in 2014. – The Ham Slams all had remarkable offensive games, and they were led by Tim, who went 8-for-8 with 4 singles, 3 doubles, a home run, 4 runs scored, and 4 RBI. – Steve hit for the cycle, going 6-for-7 with a single, 3 doubles, a triple, a home run, 4 runs scored, and 5 RBI. – Alan tied the single-game record for doubles with 4, joining Blose (2012), Hartley (2014), and Joey (2015), who also accomplished the feat. In total, he went 5-for-7 with a single, 4 doubles, 4 runs scored, and 3 RBI. – Dan went 7-for-8 in the game with 3 singles, 3 doubles, a triple, 3 runs scored, and 3 RBI. – Christian led Eastbound at the plate, going 2-for-4 with a double, a home run, an RBI, and he scored both Eastbound runs. One season after setting the single-season record for home runs with 30 in 2014, two-time defending Wiffler of the Year Bob eclipsed his own record when he hit his 31st homer of the 2015 season in his final at-bat against the Ham Slams. The wettest and windiest game of 2015 kept some balls from flying over the fence, but Bob parked three home runs over the right field wall in the game, and the third one was the record setting blast. Questionable Outfit cruised to an easy 16-6 win over the Ham Slams, and they clinched the #1 seed in the playoffs for the third consecutive season. The Ham Slams sent Tim to the mound to start, and he retired Bob to start the game, but the next hitter, Reilly, hit a solo homer to put Questionable up 1-0. Tim then retired Mike to end the inning. 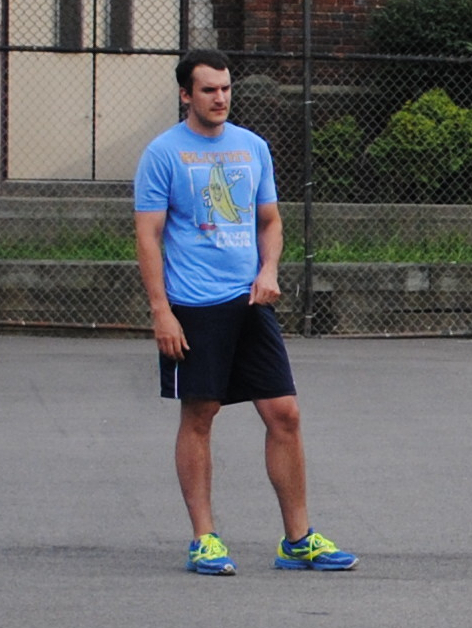 The Slams bounced back against Questionable Outfit’s starter, Mike, in the bottom of the first and tied the game. Tim led off with a double and moved to third on an Adam single. With runners on the corners, Dan grounded out to left, but Tim scored on the play to tie the game at 1-1. Mike then retired Steve to strand Adam at second. Questionable pulled ahead in the top of the second, starting when John McEnroe led off the inning with a solo homer to make the score 2-1. Bob followed with a double and moved to third on a Reilly single to put runners on the corners. Mike then hit an RBI double to score Bob, and John McEnroe followed with a two-RBI double that cleared the bases, putting Questionable ahead 5-1. 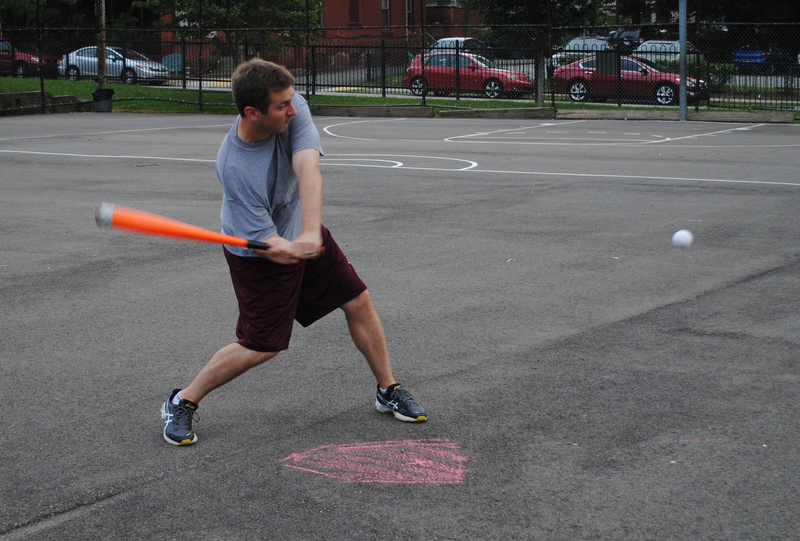 Reilly later singled to put runners on the corners with one out, but Tim retired Mike to avoid a disastrous inning. Tim had reached his innings limit for week 9, and the Slams would call Adam from the bullpen in the third. Adam hit a one-out solo homer in the bottom of the second that cut the Questionable Outfit lead to 5-2, but the Slams rally ended there as Mike retired Dan to end the inning. With one out in the top of the third, Bob hit is 29th homer of the season, a solo shot that made the score 6-2. Mike retired the Slams in order in the bottom of the third, and Questionable led by four runs. 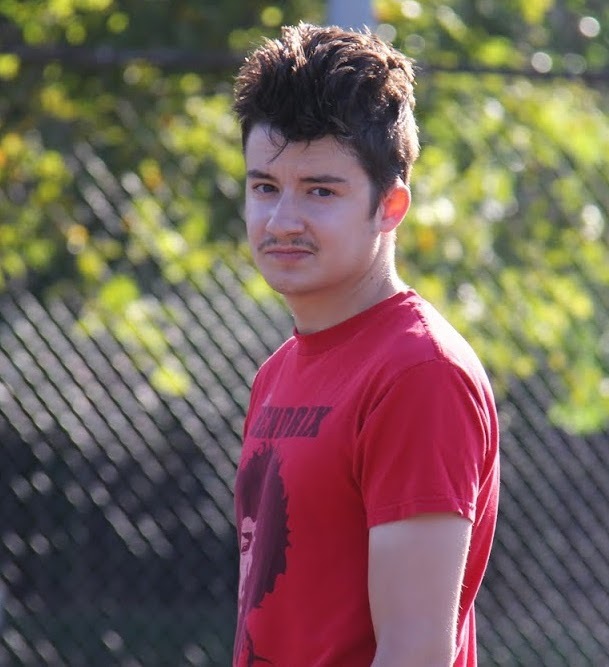 John McEnroe hit his second homer of the game in the top of the fourth, a solo homer with one out, and Questionable’s lead grew to 7-2. Mike sent Adam and Dan down in order in the bottom of the fourth. Questionable Outfit blew the game open in the top of the fifth, scoring four runs as the rain continued to fall. McEnroe led off the inning with a double, and Bob followed with a two-run homer, his 30th of the season, tying his record-setting mark from 2014. Reilly then doubled, and Mike followed with an RBI triple to score him, making the score 10-2. McEnroe hit a deep fly to right, Mike tagged and scored on the play, and the sacrifice fly extended the Questionable lead to 11-2. Bob then doubled and moved to third on a Reilly double, but Tim retired Mike, stranding two runners. The Slams showed some heart in the bottom of the fifth, narrowing the deficit with a few runs. With one out, Tim hit a solo homer, and the score was 11-3. Adam then singled, and Dan followed with a two-run homer to left-center, making the score 11-5. Steve followed with a double, but Mike cut the rally short, retiring Tim to end the inning. Up six runs, Questionable piled on an additional five runs of insurance in the top of the sixth. McEnroe led off the inning with his third homer of the game, making the score 12-5. Bob doubled, and Reilly crushed his second home run of the game, a two-run bomb that put Questionable ahead 14-5. Mike followed with a double and scored from second on a McEnroe groundout to make the score 15-5. Sitting at 30 homers on the season, Bob came to the plate in what would likely be his final at-bat of the game (and perhaps the season). In dramatic fashion, as has come to be expected, Bob planted a pitch deep over the right-center field wall for his third homer of the game and 31st home run of the season, breaking his own record only a year after setting it. There was little fanfare or photography due to the driving rain, but Questionable celebrated at the plate as Bob etched his name into the record books yet again. Tim retired Reilly to end the inning, and Questionable had pulled ahead by eleven runs 16-5. Adam led off the bottom of the sixth with a solo homer, his second of the game, and the Ham Slams pulled within ten runs. 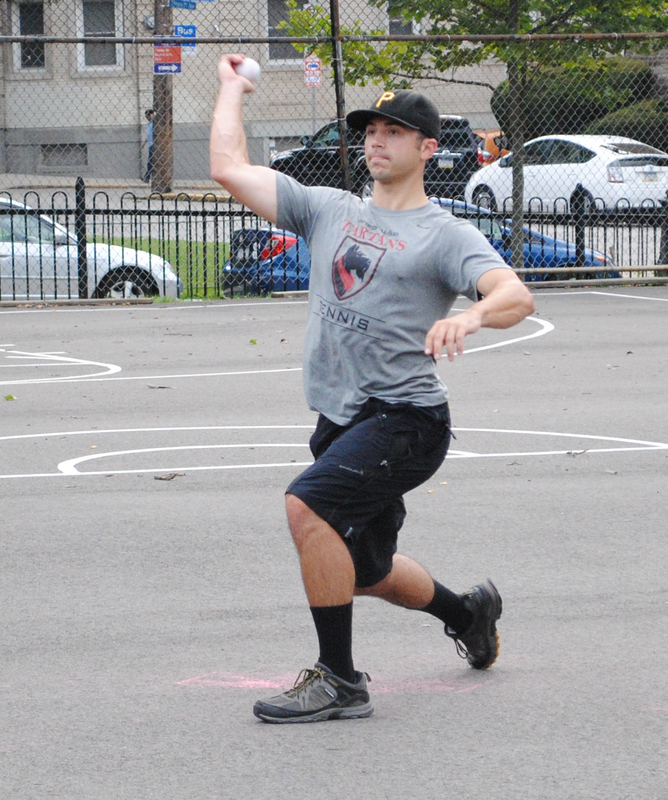 Mike then struck out Dan and retired Steve to end the inning and the game, as Questionable won 16-6. The win moved Questionable Outfit to 13-5 on the season, and they clinched the #1 seed and home field advantage throughout the 2015 EWL playoffs. The Ham Slams dropped to 6-12 and will need help to reach the #3 seed in the playoffs. 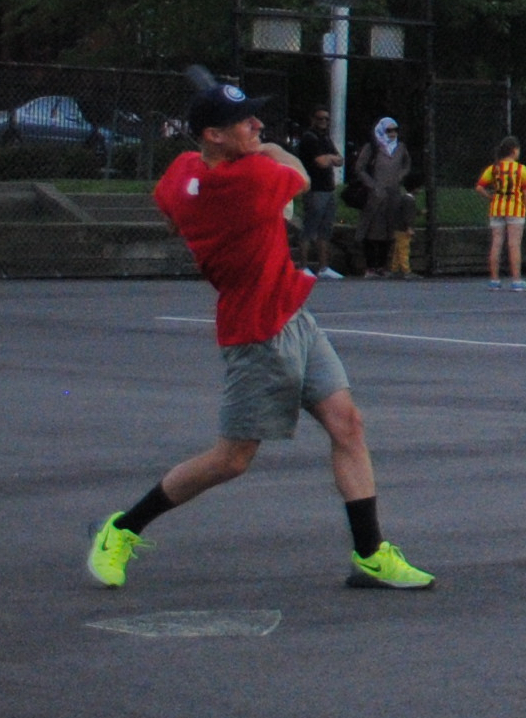 – Mike pitched the complete game victory for Questionable Outfit, allowing 6 runs on 8 hits and striking out one in 6 innings pitched. – Tim took the loss for the Ham Slams, giving up 5 runs on 7 hits in 2 innings pitched. Adam pitched 4 innings of relief, surrendering 11 runs on 15 hits. – Bob led Questionable Outfit at the plate, going 7-for-9 with a single, 3 doubles, 3 home runs, 5 runs scored, and 4 RBI. – Reilly also went 7-for-9 with 3 singles, 2 doubles, 2 home runs, 4 runs scored, and 3 RBI. – Adam led the Ham Slams on offense, going 4-for-5 with 2 singles, 2 homers, 3 runs scored, and 2 RBI. Morrison of Eastbound & Dahn and Steve of the Ham Slams each went 4-for-5 with 3 home runs, but Eastbound escaped with an 8-7 win, holding off a late Ham Slams comeback. 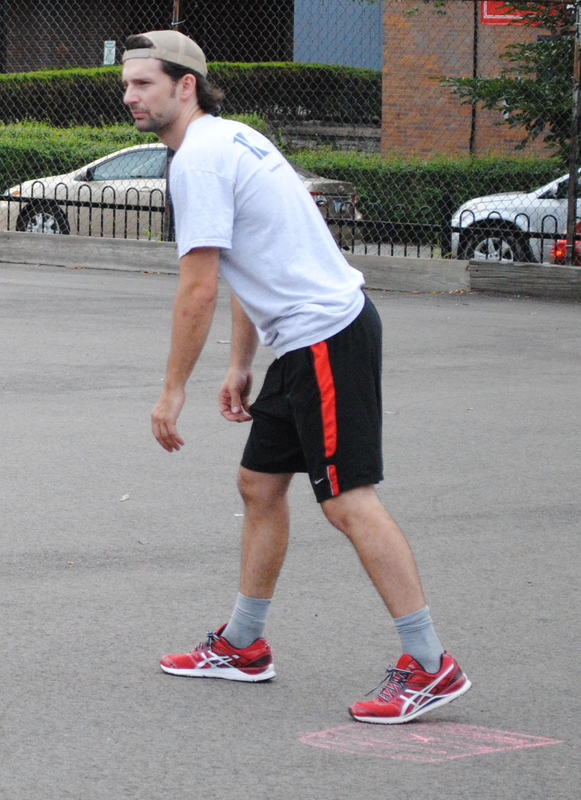 Tim took the mound for the Ham Slams, and he fell victim to the wrath of Morrison and Eastbound early. Hartley led off the game with a double, and Morrison followed with a two-run bomb to put Eastbound ahead 2-0. Christian followed with a single, but Tim got Steve go ground out for the first out, and Steve D retired Christian between first and second to record a double play and end the inning. The Slams would cut the deficit in half in the bottom of the first. Tim led off the inning with a double, but was caught in between second and third for the first out of the inning. Christian, Eastbound’s starter, then gave up a solo shot to Adam, making the score 2-1. Tim retired the side in order in the top of the second, as both Hartley and Morrison flew out to the mound. Christian matched Tim in the bottom of the second, stranding two Ham Slams runners to maintain the 2-1 lead. Eastbound would add to their lead in the top of the third. Steve hit a one-out double, and Hartley followed with a two-run homer, putting Eastbound ahead 4-1. Morrison then hit his second homer of the game, and the back-to-back blasts made the score 5-1. Steve D led off the bottom of the third with a solo homer, cutting the score to 5-2. Christian retired the following two batters to end the inning. Eastbound made up the runs in the top of the fourth when Steve led off with a single, and two batters later Morrison hit his third homer of the game, which put Eastbound ahead 7-2. Christian retired the side in order in the bottom of the fourth, and Eastbound would add one more insurance run in the top of the fifth. With one out, Hartley hit a solo homer, his second blast of the game, and Eastbound led 8-2. Morrison followed with a triple, but Tim stranded him to end the inning. The Ham Slams trailed by six runs heading into the bottom of the fifth when they started to rally, cutting into the deficit. Tim led off the inning with a double, and two batters later, Dan hit a two-run homer, making the score 8-4. Steve followed with his second homer of the game, a solo shot, cutting Eastbound’s lead to 8-5. Tim then singled, and he scored from first when Adam hit an RBI triple. Christian then retired Dan to end the inning, but the Slams had cut the score to 8-6. Tim retired Eastbound & Dahn in order in the top of the sixth, and the Slams headed to the bottom of the sixth down two runs. Steve, the first batter of the inning, hit a solo homer, his third of the game, and the score was 8-7. Eastbound left Christian on the mound, and he buckled down, retiring Tim and Adam to end the inning and the game, giving Eastbound an 8-7 victory. The win moved Eastbound to 9-8 on the year, and the Ham Slams fell to 6-11 with the loss. – Christian pitched the complete game win for Eastbound, allowing 7 runs on 11 hits in 6 innings pitched. – Tim took the loss for the Ham Slams, giving up 8 runs on 10 hits in 6 innings. – Morrison led Eastbound & Dahn on offense, going 4-for-5 with a double, 3 home runs, 3 runs scored, and 5 RBI. 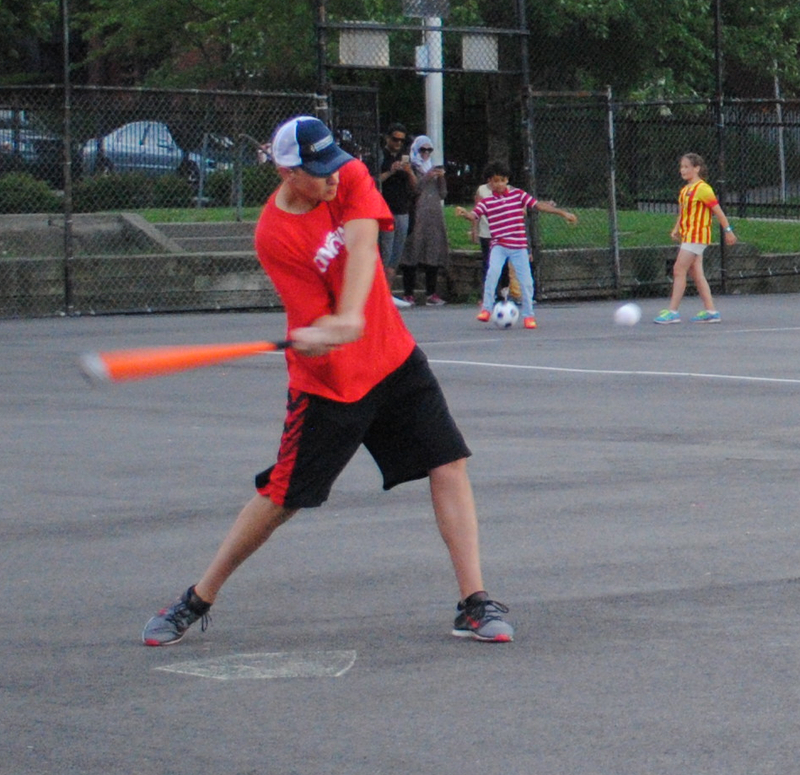 – Tim also had a solid game at the plate, going 3-for-6 with a double, 2 homers, 3 runs scored, and 3 RBI. – Steve led the Ham Slams, going 4-for-5 with a single, 3 home runs, 3 runs scored, and 3 RBI. Bob, Reilly, and Mike each hit two homers as Questionable Outfit pulled away late to beat Cookies & Cream 9-3 and pull within one win of clinching the #1 seed in the playoffs for the third consecutive year. Questionable would play their week 9 games without Tom, calling John McEnroe from the waiver wire as a replacement. Reilly started on the mound for Questionable, and Cookies would get to him in the top of the first to take an early lead. Joey led off the game with a single, and the next batter, Blose drove him in from first with an RBI single to make the score 1-0. Dustin then grounded out for the first out of the inning, scoring Blose to put Cookies ahead 2-0. Reilly then retired Vassallo for the second out of the inning, and he only allowed 3 more hits the entirely of the game. Guthrie returned to the mound for Cookies & Cream in his first performance in over a month. He picked up where he left off, retiring the side in order in the bottom of the first. Reilly got back to form in the top of the second, retiring Dinger and Guthrie consecutively for a scoreless inning. Guthrie matched him in the bottom half of the inning, and Cookies led 2-0 through two innings. Cookies picked up some run support in the top of the third when Les led off the inning with a solo homer to make the score 3-0. Joey followed with a single, but Reilly retired Blose and Dustin to strand the runner and avoid further damage. Down three runs, Questionable would draw even in the bottom of the third. Bob led off the inning with a solo home run to cut the score to 3-1. Two batters later, Mike hit a one-out solo shot, and the score was 3-2. John McEnroe followed with a solop homer, and the back-to-back jacks tied the game at 3-3. Guthrie retired Bob to end the inning, and the game was tied through three innings. Reilly pitched a scoreless frame in the top of the fourth, and Questionable pulled ahead for good in the bottom half of the inning. Reilly provided his own run support with a solo homer to lead off the inning, putting Questionable ahead 4-3. Mike then tripled, and John McEnroe followed with an RBI single to make the score 5-3. Bob then singled, scoring McEnroe from first, and Questionable led 6-3. Guthrie then fanned Reilly and retired Mike to end the inning, but Cookies trailed by three runs. Reilly retired the side in order in the top of the fifth, and Questionable added a few insurance runs in the bottom of the fifth. With one out, Bob homered for the second time in the game to make the score 7-3. Reilly and Mike then each hit their second home runs of the game, and Questionable’s three consecutive homers put them ahead 9-3. Down six runs in their final at-bat, Cookies went down easy in the top of the sixth. Reilly retired Blose and Dustin in order, ending the game with Questionable ahead 9-3. The win moved Questionable Outfit to 12-5 on the season, and the loss, Cookies & Cream’s fifth straight, dropped them to 7-10. – Reilly pitched the complete game win for Questionable Outfit, scattering 3 runs on 5 hits in 6 innings. He retired 12 of the final 15 batters he faced. – Guthrie took the loss for Cookies & Cream, giving up 9 runs on 10 hits in 5 innings while striking out one. 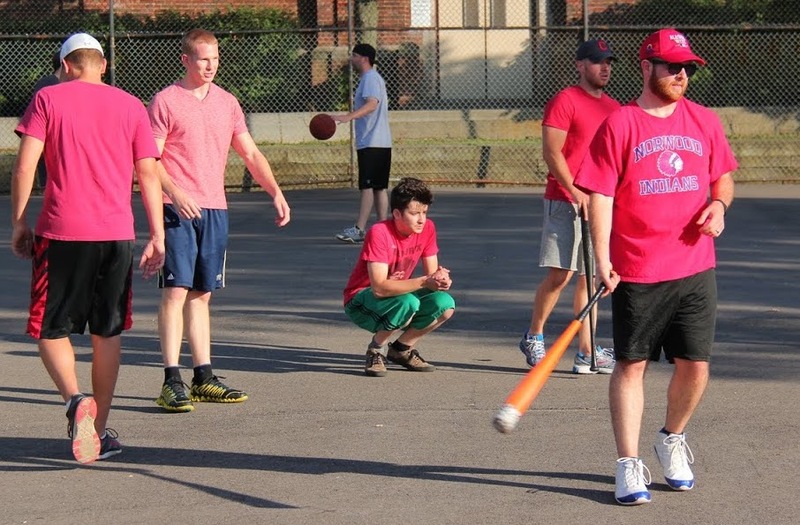 – Mike led Questionable Outfit on offense, going 3-for-5 with a triple, 2 homers, 3 runs scored, and 2 RBI. – Bob and Reilly each homered twice for Questionable Outfit. – Joey was the only member of Cookies & Cream to collect multiple hits, going 2-for-3 with 2 singles and a run scored in the losing effort. Morrison continued his torrid streak at the plate, hitting three home runs as Eastbound & Dahn pulled away from Cookies & Cream to win 8-5 and hand Cookies their sixth consecutive loss. With two innings of eligibility left, Christian started for Eastbound & Dahn, and he got into an early hole. Joey, the game’s first batter, led off with a solo homer, putting Cookies & Cream ahead 1-0 immediately. Blose followed with a double, and he scored on a Dustin ground out to make the score 2-0. Christian then retired Vassallo to end the inning, and Cookies led by two. Eastbound would cut the Cookies lead in half in the bottom of the first. Guthrie, the Cookies starter, retired Tim for the first out of the inning, but Morrison followed with a solo homer, and the score was 2-1. Christian allowed a one-out single to Guthrie in the top of the second, but stranded him, maintaining the one-run deficit. Eastbound & Dahn pulled even in the bottom of the second when Steve led off with a triple and scored on a Tim ground out to tie the game at 2-2. Guthrie then intentionally walked Morrison and retired Christian to end the inning. Cookies reclaimed the lead in the top of the third, scoring three runs off Steve, who came in to relief Christian. Steve retired the first batter he faced, but after a Blose single, Dustin hit a two-run homer putting Cookies back on top 4-2. Vassallo followed with a homer, and the back-to-back bombs gave Cookies & Cream a 5-2 lead. Eastbound bounced back yet again in the bottom of the third. Steve led off the inning with a solo homer, cutting the Cookies lead to 5-3. Tim then doubled, and Morrison followed with a two-run bomb, tying the game at 5-5. Guthrie retired the next two batters to end the inning, but he had surrendered a three-run lead. Les hit a one-out double in the top of the fourth, but Steve stranded him, and the game remained tied. Eastbound would pull ahead in the bottom of the fourth. Guthrie had reached his pitch limit, so Cookies turned to Joey. He retired the first batter he faced, but the next batter, Morrison, hit a solo homer to put Eastbound ahead 6-5. Christian followed with a solo shot to right, and the back-to-back homers gave Eastbound & Dahn a 7-5 lead. Steve retired the side in order in the top of the fifth, and Eastbound would provide one more insurance run in the bottom half of the inning. Tim led off with a solo homer, putting Eastbound ahead 8-5. Joey then struck out Morrison and retired Christian to end the inning, and Cookies would trail by three runs heading into the top of the sixth. Steve remained on the mound for Eastbound, and he gave up a single to Vassallo to start the inning. But Cookies & Cream couldn’t rally, as Steve retired Dinger and Guthrie to end the inning and the game, as Eastbound held on to win 8-5. The win moved Eastbound & Dahn to 10-8 on the season, and Cookies suffered their sixth straight loss, dropping their record to 7-11. – Steve picked up the win in relief for Eastbound & Dahn. He allowed 3 runs on 5 hits in 4 innings. Christian took the no decision, allowing 2 runs on 3 hits in 2 innings pitched. – Joey earned the loss for Cookies & Cream, giving up 3 runs on 3 hits while striking out one in 2 innings of relief. Guthrie got a no decision, allowing 5 runs on 5 hits in 3 innings. – Morrison led Eastbound & Dahn on offense, going 3-for-4 with 3 homers, 3 runs scored 4 RBI, and an intentional walk. – Joey, Dustin, and Vassallo each homered for Cookies & Cream. Despite trailing the entire game, Steve’s sixth inning homer drew the Ham Slams even with Cookies and Cream, and the Slams pulled ahead in extra innings to win their fifth consecutive game. The win pulled them within a game of Cookies & Cream for third place in the EWL standings. With Guthrie still out of the lineup traveling, Dinger took the mound for Cookies & Cream for the second time in week 8. He retired the Ham Slams in order in the top of the first. Charlie also started his second game of week 8, and he matched Dinger, pitching a scoreless bottom of the first for the Slams. Alan hit a one-out double in the top of the second, but Dinger stranded him, and the game remained tied at 0-0 heading into the bottom of the second. Similarly, Dustin led off the bottom of the second with a double, but Charlie prevented him from advancing, retiring the next two batters to maintain the scoreless tie. Dinger had exhausted his pitching eligibility for the week, and Cookies & Cream turned to Joey from the bullpen. He immediately got into trouble, giving up a triple to the first batter he faced, Adam. Two batters later, Alan crushed a two-run homer to left, putting the Slams ahead 2-0. Cookies provided some run support in the bottom of the third, pulling ahead of the Slams. Charlie had also used up all his innings for week 8, and the Slams turned to Tim. He retired Dinger for the first out of the inning, but Dustin followed with a solo homer, making the score 2-1. Chase singled for his first career EWL hit, and Joey followed with a two-run home run, putting Cookies & Cream ahead 3-2. Joey retired Adam and Steve consecutively in the top of the fourth to maintain the one-run Cookies lead. Tim matched him in the bottom half of the inning, and the score remained 3-2 Cookies & Cream. Tim evened up the score in the top of the fifth when he hit a one-out solo homer to tie the game at 3-3. Cookies & Cream took the lead back in the bottom of the fifth when Dinger hit one-out solo shot, making the score 4-3. Joey stayed on the mound to close things out for Cookies & Cream in the top of the sixth, but before he could record an out, Steve led off the inning with a solo homer to right-center, tying the game at 4-4 and giving the Ham Slams life. Joey retired the next two batters, however, and the game was tied heading into the bottom of the sixth. Chase led off the bottom half of the inning with a single, putting the winning run on first. But Tim cracked down, retiring Joey and Dinger in order to strand the runner and force extra innings. The Ham Slams continued to hit Joey in the top of the seventh, as Adam led off the inning with a solo homer, putting the Slams ahead 5-4. Two batters later, Alan hit a one-out triple, and he scored when Tim hit an RBI single, and the Slams led 6-4 heading into the bottom of the seventh. Down to their final at-bat, it looked as if Cookies would rally. Dustin led off the inning with his second homer of the game, pulling Cookies & Cream within a run. Chase singled, and the tying run was on base. But once again, Tim buckled down and retired Joey and Dinger to strand the runner and end the game, giving the Ham Slams a 6-5 win in seven innings. The win moved the Slams to 6-10 on the season and only one game back of Cookies & Cream, who fell to 7-9. – Tim earned the win for the Ham Slams in relief. He pitched 5 innings, allowing 5 runs on 7 hits. Charlie took the no decision for the Slams, allowing 1 hit and no runs in 2 innings. – Joey took the loss for Cookies & Cream, pitching 5 innings of relief while giving up 6 runs on 7 hits. Dinger started for Cookies & Cream and got the no decision, allowing 2 hits and no runs in 2 innings. – Alan led the Ham Slams at the plate, going 3-for-5 with a double, a triple, a homer, 2 runs scored, and an RBI. – All four Ham Slams homered in the win. – Dustin led Cookies & Cream on offense, going 3-for-5 with a double, 2 home runs, 2 runs scored, and 2 RBI. Reilly continued to display his elite pitching skills as he kept the Eastbound & Dahn offense in check, leading Questionable Outfit to an 8-3 win, the third straight for the first place team. The game featured a matchup of the EWL’s two best pitchers in 2015, Reilly and Helal. Reilly retired the Eastbound side in order in the top of the first, and despite giving up two singles, Helal did the same in the bottom of the first, stranding both runners. Eastbound took an early lead in the top of the second, when Crustin led off the inning with a solo homer to make the score 1-0. Reilly then retired Helal and Nate to end the inning. Questionable got on the board and took the lead in the bottom of the second. Bob led off with a double and moved to third on a Reilly single, putting runners on the corners. Mike doubled, scoring Bob to tie the game at 1-1. Stove then grounded out to left, but Reilly scored on the play to put Questionable ahead 2-1. Bob got his second hit of the inning, an RBI single that scored Mike, and the Questionable lead was 3-1. Helal then retired Reilly to end the inning. Christian led off the top of the third with a single, but when the next batter, Crustin, also singled, Christian was caught in between first and second for the first out. Reilly then got Helal to ground out to left to end the inning. Helal retired the side in order in the bottom of the third, and the score remained 3-1 through three. Eastbound would draw even in the top of the fourth with back-to-back homers. With one out, Christian homered over the right field fence, making the score 3-2. Crustin followed with his second homer of the game, tying the game at 3-3. Questionable didn’t take long to pull back ahead, scoring three runs in the bottom of the fourth. Bob singled and scored when two batters later Mike hit an RBI double to make the score 4-3. Stove then hit an inside-the-park homer with the help of a throwing error, and Questionable led 6-3. Christian singled with one out in the top of the fifth, and he moved from first to third when Crustin followed with a single. Eastbound had a chance to rally with runners on first and third and the tying run at the plate, but Reilly got Helal to ground out to center, stranding both runners and ending the inning. Questionable added two more runs of support in the bottom of the fifth, which would be more than enough for Reilly. Reilly singled to start the inning and moved to third on a Mike double. Stove then hit a deep sacrifice fly to center, scoring Reilly to make the score 7-3. Bob followed with a single, scoring Mike, and Questionable pushed their lead to 8-3. Helal retired Reilly to end the inning, but Questionable had a five-run lead heading into the sixth. Reilly allowed a one-out single to Christian in the top of the sixth, but he stranded the runner, pitching a scoreless inning to end the game and give Questionable Outfit an 8-3 win. 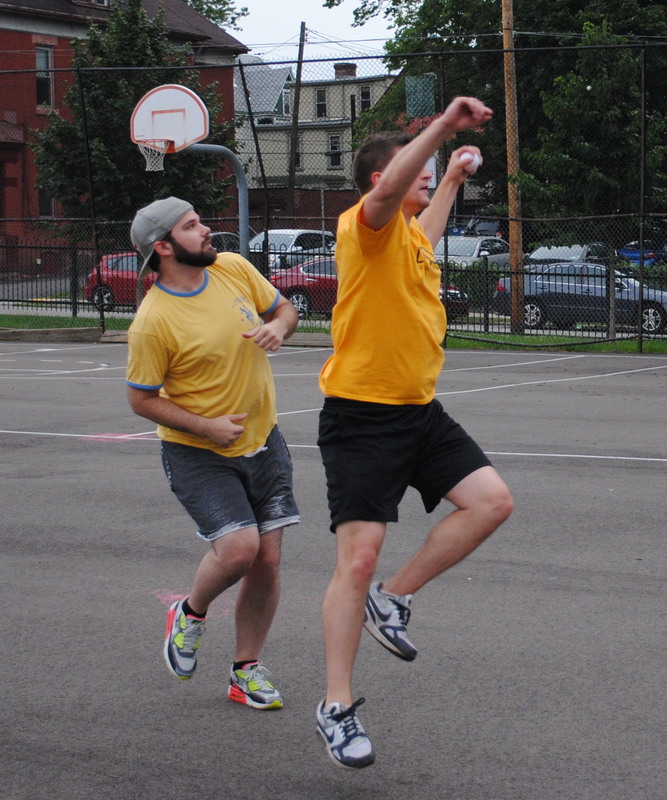 The win moved Questionable to 11-5 on the year and extended their lead in first place. Eastbound dropped to .500 at 8-8 on the season, three games out of first. – Reilly pitched the complete game win for Questionable Outfit, allowing 3 runs while scattering 8 hits in 6 innings. – Helal took the loss in the complete game outing, giving up 5 runs on 12 hits in 5 innings pitched. – Bob and Mike led Questionable Outfit at the plate, each collecting 4 hits. Bob went 4-for-6 with 3 singles, a double, 2 runs scored, and 2 RBI, while Mike went 4-for-5 with a single, 3 doubles, 3 runs scored, and 2 RBI. – Christian and Crustin led Eastbound on offense, both going 4-for-5. Christian had 3 singles, a homer, a run scored, and an RBI. Crustin had 2 singles, 2 home runs, 2 runs scored, and 2 RBI.